California is not only one of the largest and most populated states in America, it also ranks very high as one of the most-visited regions in the United States and the world, drawing millions of people each year from every corner of the country and globe. There are several factors that have led to California’s popularity as a vacation destination, not the least of which is its amazing climate. Perhaps like no other region in the U.S., California boasts a very pleasant climate throughout the year, thus allowing its many exciting sights and attractions to continue doing business even during the winter months—a time when a good portion of the country is cursing the cold, shoveling snow and praying for an early spring. California is perhaps best known for the various cities and idyllic regions that comprise it. Popular tourist destinations in California include the cities of Los Angeles (Hollywood), San Diego, San Francisco, San Jose and Sacramento, the latter of which serves as the state capital and the headquarters for everything political. In addition to these large, well-visited and heavily populated cities, there are also hundreds of other cities, towns and hamlets that lie in between, each with their own character, attractions and electric vibe. One of the greatest aspects of California is that no matter where you decide to stay when visiting this great state, you are always just an easy drive away from its Pacific beaches, mountains and deserts, all of which present many opportunities for recreation and relaxation. In the following article we will highlight, in some detail, five of the coolest things to do and see when visiting the Golden State, including some very well-known attractions and a couple that are most certainly off the beaten path. Wine is a massive industry in California, and when it comes to wine production and wine tasting, the northern, near-coastal city of Napa has dominated the conversation for years and years. And while the Napa-produced wines are indeed superb, recently a brand new player has emerged in the world of California wine, and its name is Lodi. With a population barely approaching 75,000, Lodi is considered a very small town by California standards. However, what it lacks in size and population, it more than makes up for in character—and wine production. Lodi is a north-central California city, sandwiched between the much larger cities of Stockton, to the south; and Sacramento, to the north. Lodi is recognized as a massive player in the wine producing arena, boasting millions of vines at any given time—vines that represent a variety of grape types. As of the writing of this piece, Lodi is now home to over 50 tasting rooms and an even greater number of farms dedicated to the production of tasty wine grapes. Every year, come late August to early September, the yearly grape harvest commences, which is punctuated by the annual Lodi Grape Harvest Festival, a three-day fair celebration that features wine tasting, live entertainment and amusement park rides for the kids. The results of Lodi’s grape harvests, crushes and bottling have recently started to catch the attention of the national and international wine community. Lodi grows grapes (and produces wines) that have now won several awards across many different wine spectrums, including white wines such as Chardonnays, Pinot Grigios, and Sauvignon Blancs; and bold red wines such as Cabernets, Merlots and especially Zinfandels. These wines are served up year round in the many Lodi wine tasting rooms, an experience that is very popular among the city’s local residents. Perhaps one of the best aspects of wine tasting in Lodi is the friendly growers who pour the wines and answer wine-related questions. Simply put, if you plan to be in the north-central part of California on your upcoming holiday, and if you love good wine, you may want to ditch the large crowds and hype of Napa and set sail for Lodi, California instead. Located in the town of Buena Park, California, just a short hop from the city of Los Angeles in the southern region of the state, Knott’s Berry Farm is a large amusement park and one of the coolest of its kind in the entire state. Knott’s Berry Farm is a fun attraction for everyone in the family—a place with so much to do and see that it is virtually impossible to experience all of it in a single day. Roller Coasters and Thrill Rides. Although definitely not for the faint of heart, Knott’s Berry Farm’s roller coasters and high-flying thrill rides are full of twists, turns, towering plunges and all the adrenaline that goes along with it. Family Rides. From twisting tea cups, to carousels, to Ferris wheels, Knott’s Berry Farm has more than its fair share of family rides that promise to keep you busy throughout the day. There are also a number of water rides to keep you cool during a hot summer day, including the famous Knott’s Log Ride. Children’s Rides. The 6-acre children’s area at Knott’s Berry Farm—designed for toddlers and tykes and their parents, offers more than 30 rides and attractions. Kids can race in stock cars, fly planes, drive a bus, cruise in their very own 18-wheeler and enjoy countless other pint-sized thrills. Games and Arcades. With three large arcades and a massive number of fair-style games, family members can challenge each other and show off their skills. Live Entertainment. At Knott’s Berry Farm there is always something to see. With stunt shows, comedy, music and more, the park offers “must-see” entertainment for every age group. Shopping. There are several trendy shops both inside and just outside the park, selling everything from souvenirs to candy to jewelry. Dining. The Knott’s Berry Farm Steakhouse and famed Chicken Restaurant highlight a huge list of dining and snacking establishments at the park. Don’t forget to ask for some genuine Knott’s Boysenberry Jam. Straddling the California/Nevada border, South Lake Tahoe is one of the coolest destinations in California, offering many opportunities for fun and relaxation. At South Lake Tahoe, visitors will find the largest alpine Lake in North America, a place that is both deep and wide and bluer than blue. The lake is completely surrounded by the majestic Sierra Nevada Mountains, which consistently lure skiers and snowboarders in the winter and hikers and swimmers in the summer. A true alpine paradise, South Lake Tahoe offers spectacular scenery and an abundance of things to do year-round, including water sports and winter sports, bike trails, great shops and amazing nightlife. The Nevada side of South Lake Tahoe is home to four massive hotel/casinos, including Harrah’s Lake Tahoe, Harvey’s Lake Tahoe, the Hard Rock Hotel and Casino, and the Mont Bleu Hotel and Casino. Each of these great spots offer accommodations for guests, as well as casino games, such as Blackjack, Poker, Roulette Craps, and Slot Machines; and several amazing restaurants serving a wide variety of tasty treats. One of the coolest activities at South Lake Tahoe is the tram lift that takes visitors to the very top of the Sierra Nevada Mountains, a 30-minute round trip ride that offers amazing scenery and unlimited opportunities for photos. Tickets for this ride are only $45 per person—and worth every penny. Regardless of the season, South Lake Tahoe is known as “the” place to be for outdoor recreation and indoor fun. The Redwood National Park is an almost-infinite expanse of beautiful woodland, rivers and coastline where guests can partake in a wide array of outdoor activities. The Redwood trees are some of the oldest and tallest trees in the United States—so tall that they have to be seen for one to truly appreciate their sheer size. One of these renowned trees was hollowed out near the bottom of the trunk, creating a hole that even automobiles can drive through. 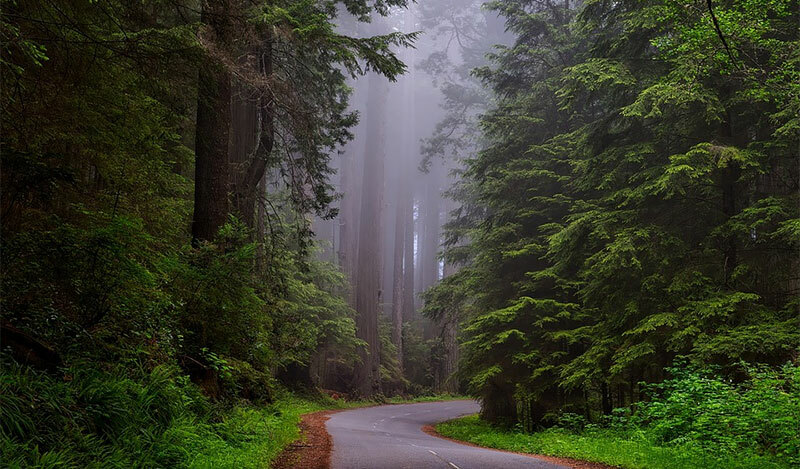 The wildlife within the Redwood National Park forest and along the Pacific coast side is exceedingly diverse and consists of a number of rare and protected species of animals. For those who plan to stay at the park for but a single day, one of the great things to do in the forest is to simply take a relaxed walk and allow yourself plenty of opportunities to admire what are now the tallest trees on the planet. Hikers and backpackers will absolutely love the Redwood National Park, as there are many different hiking routes in the region—hikes that are very lengthy and incredibly scenic. There are also five informative visitor centers at the park, and an eight-mile scenic drive known as the Coastal Drive. A marvel of modern engineering and construction, the Golden Gate Bridge, which is located in San Francisco, California, is one of the most emblematic landmarks in the United States. Throughout the year, and during every season, the bridge is photographed countless times and visited by enormous crowds of tourists from around the United States and throughout the globe. The Golden Gate Bridge spans the San Francisco bay for over a mile. Its recognizable red hue was purposely chosen to make the bridge more visible in the foggy conditions that frequently engulf the San Francisco Bay Area. There are many ways to see the Golden Gate Bridge. You can drive, walk or cycle across the bridge, or simply admire it from afar. Additionally, if the history of the Golden Gate Bridge is something your family and/or group are interested in, there are a number of guided tours available by appointment, as well as pamphlets that recount the bridge’s design, construction and history.